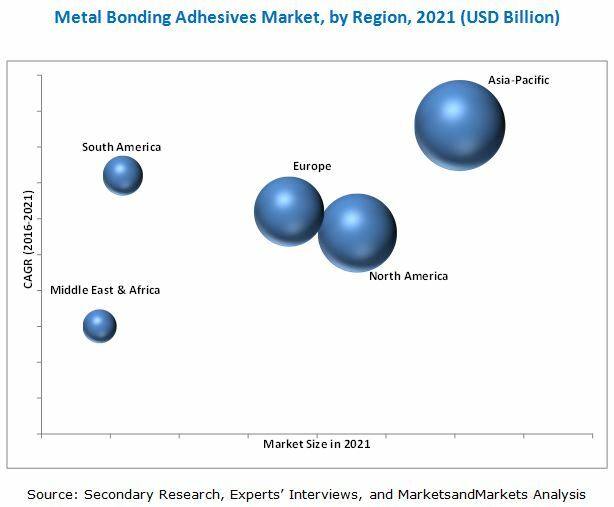 [158 Pages Report] The Metal Bonding Adhesives Market was valued at USD 5.30 Billion in 2015 and is projected to reach USD 7.70 Billion by 2021, at a CAGR of 6.5% from 2016 to 2021. In terms of volume, the metal bonding adhesives market is projected to grow from 1,337.5 KT in 2015 to 1,871.1 KT by 2021, at a CAGR of 5.8% from 2016 to 2021. In this study, 2015 has been considered as the base year, 2016 as the estimated year, and 2021 as the projected year. To identify and analyze the key drivers, restraints, opportunities, and challenges influencing the growth of the metal bonding adhesives market. Varied secondary sources such as company websites, encyclopedias, directories, and databases that include Hoovers, Bloomberg, Businessweek, Factiva, and OneSource have been used to identify and collect information useful for this extensive and commercial study of the metal bonding adhesives market. Primary sources including experts from related industries have been interviewed to verify and collect critical information and assess the future prospects of the market. The top-down approach has been implemented to validate the market size in terms of value. With the data triangulation procedure and validation of data through primaries, the exact values of the overall parent market size and individual market sizes have been determined and confirmed in this study. The metal bonding adhesives market has a diversified and established ecosystem of upstream players, such as raw material suppliers and downstream stakeholders such as manufacturers, vendors, end users, and government organizations. This study answers several questions for stakeholders, primarily which market segments they should focus upon during the next two to five years to prioritize their efforts and investments. These stakeholders include metal bonding adhesives manufacturers such as Henkel AG & Co. KGaA (Germany), H.B. Fuller (U.S.), The 3M Company (U.S.), Sika AG (Switzerland), The Dow Chemical Company (U.S.), Arkema S.A. (France. ), Solvay S.A., (Belgium), LORD Corporation (U.S.), DELO Industrie Klebstoffe GmbH & Co. KGaA (Germany), and Parson Adhesives, Inc. (U.S.). 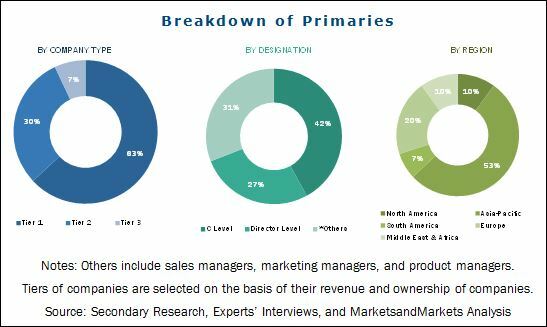 This research report categorizes the metal bonding adhesives market based on resin type, application, and region, and forecasts the revenue growth and provides an analysis of trends in each of the submarkets. Each type is further described in detail in the report with value forecasts until 2021. Each region is further segmented into key countries such as the U.S., Mexico, Canada, China, Japan, South Korea, India, Indonesia, Germany, the U.K., Italy, France, Turkey, Russia, Saudi Arabia, the UAE, Argentina, and Brazil. The metal bonding adhesives market was valued at USD 5.30 Billion in 2015 and is projected to reach USD 7.70 Billion by 2021, at a CAGR of 6.5% from 2016 to 2021. In terms of volume, the metal bonding adhesives market is projected to grow from 1,337.5 KT in 2015 to 1,871.1 KT by 2021, at a CAGR of 5.8% during the forecast period. Stringent government regulations to enhance fuel economy; growth of the automotive, pharmaceuticals, and mining industries; steadily improving GDPs; and increased adoption of adhesives in automotive applications are factors anticipated to propel the growth of the metal bonding adhesives market. The epoxy-based metal bonding adhesives segment is the largest resin type segment of the metal bonding adhesives market, followed by acrylic-based metal bonding adhesives segment. Epoxy-based adhesives are widely preferred for metal bonding, owing to their durability, high strength, temperature resistance, and excellent depth of cure. These adhesives are also known as Crash Durable Adhesives (CDA), as they encompass superior bonding properties resulting into improved crash resistance. Hence, epoxy-based metal bonding adhesives are widely preferred in manufacturing lightweight automotive parts. The automotive & transportation segment is the largest application segment of the metal bonding adhesives market. Metal bonding adhesives are extensively used in the automotive & transportation industry. These are widely used by Original Equipment Manufacturers (OEMs) for automotive exteriors and panel bonding. Metal bonding adhesives are also used for bonding body panels of buses and trucks. The industrial segment is the second-largest application segment of the metal bonding adhesives market. Metal bonding adhesives are used in industrial applications as an alternative to traditional bonding methods for heat treatment and fastening. Metal bonding adhesives are widely used in industrial applications, including ultracentrifuge rotors, machinery base plates, cooling water pumps, reaction injecting molding machines, cooling water pumps, and industrial pumps. These adhesives are utilized by the healthcare industry for bonding applications in dialysis machines, filters, needle bonding, and X-ray & imaging equipment. Metal-to-metal bonding applications in the construction industry such as scrapers and trenchers are considered under the industrial segment. The Asia-Pacific region was the largest regional segment of the metal bonding adhesives, market, in terms of value and volume, in 2015. Industrial growth in countries such as India, Vietnam, Indonesia, and Thailand, and increased investments in chemicals, petrochemicals, oil & gas, and food & beverages industries are key factors driving the growth of the Asia-Pacific metal bonding adhesives market. Furthermore, increase in investments made by companies in the automotive sector, the shift of production facilities to emerging economies, and strong industrial base, are additional factors contributing to the growth of the metal bonding adhesives market in the Asia-Pacific region. Availability of raw materials across the globe and adoption of development strategies to meet the growing demand for metal bonding adhesives are propelling the growth of this market. Henkel AG & Co. KGaA (Germany), H.B. Fuller (U.S.), The 3M Company (U.S.), Sika AG (Switzerland), The Dow Chemical Company (U.S.), Arkema S.A. (France. ), Solvay S.A., (Belgium), LORD Corporation (U.S.), DELO Industrie Klebstoffe GmbH & Co. KGaA (Germany), and Parson Adhesives, Inc. (U.S.) are key players operating in the metal bonding adhesives market. Diverse product portfolios, strategically positioned R&D centers, and technological advancements are some of the factors that help strengthen the market position of these companies in the metal bonding adhesives market.